Invisalign® is the newest product in tooth straightening systems. Unlike traditional metal braces, Invisalign® Aligners are clear and nearly undetectable. They are conveniently removable for eating, brushing, and flossing your teeth. Invisalign® Aligners are comfortable. They are custom made to fit your teeth. Invisalign® Aligners are typically worn for about 12 months. They are usually covered by dental insurance policies that cover traditional braces. Invisalign® is appropriate for both teenagers and adults. You may be a candidate for Invisalign® if your teeth are too crowded or have unequal spaces between them. 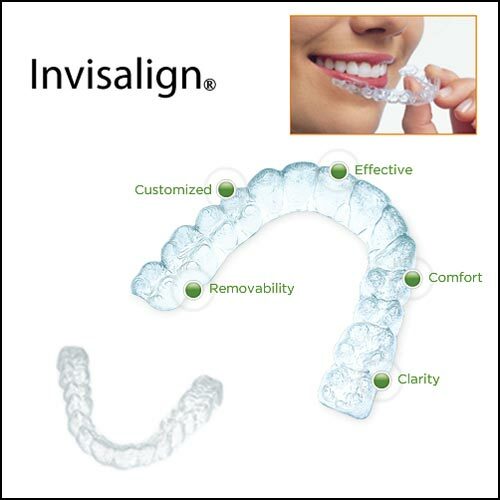 Invisalign® is perfect for adults that have had teeth shift after wearing braces as teenagers. Only dentists that have been trained and certified can provide treatment with Invisalign®. A certified dentist can determine if Invisalign® is right for you. The dentist will examine your teeth and gums. To get started, your dentist will make a mold of your teeth and write a treatment plan. Your mold and treatment plans are submitted to Invisalign®. The sophisticated computer technology at Invisalign® constructs 3D images of your teeth. These are used as a basis to create a precise series of aligners, custom made for your teeth. Aligners are worn day and night. You can remove them when you eat or brush and floss your teeth. The aligners are clear and practically unnoticeable. You will wear each aligner for approximately two weeks. Your teeth will shift gradually in a series of precise increments. When you have achieved the desired result with an aligner, your dentist will issue you the next aligner in your series. 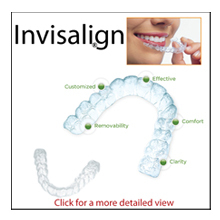 Invisalign® is a great alternative for select people that do not want to wear traditional metal braces. Invisalign® is comfortable and discreet. It can straighten your teeth and improve your smile.